We have launched new plugin “ Coming Soon Page & Maintenance Mode Pro ” WordPress plugin. If you build a new site in WordPress, you should absolutely use “Coming Soon Pro” to show a beautiful landing coming soon page with easy customization. 503 Service Unavailable Mode (Useful when you want to disabled the site temporary when you work with your web server). Redirect Mode (To introduce your new site URL in your existing site URL). 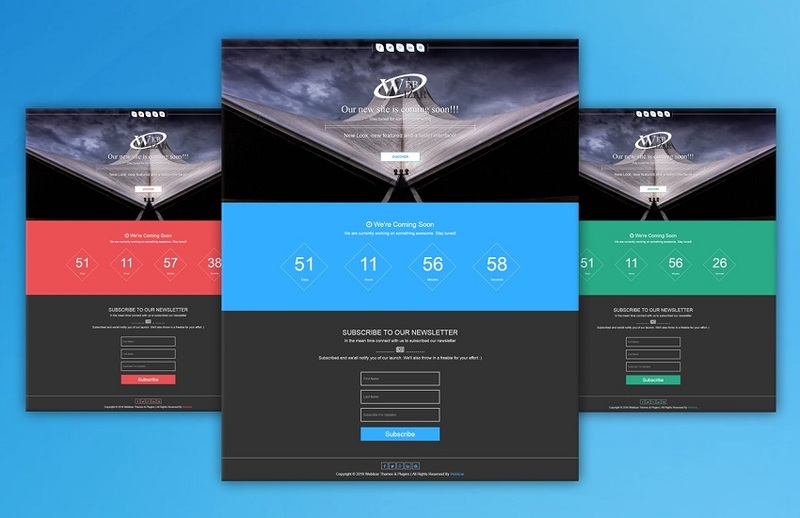 New “Coming Soon Pro” plugin come with multiple responsive landing page template with also unlimited social icon, Newsletter subscriber form (with multiple newsletter API), Contact form, Google map, Service section, Team members (with social links) and Testimonial section. “Coming Soon Pro” plugin have easy customization dashboard. Where you can change page layout, color schemes, font families and many more. “Coming Soon Pro” plugin come with one and more responsive template. with many attractive features. We can use coming soon mode in initial phase of the site, here are some key point. Hide the all sites from others and show the only, coming soon page template. Under construction mode use when you hide the specific page and post to your users. Hide the only selected pages and post on the site from users and so the only under the construction mode page template. Please change the SEO title, description and keywords from general settings to maintain the site SEO as a message page template. Maintenance mode useful when you want hide the all site from users for a specific time frame. Hide the all sites from the users for a specific e time frame and so the only under the maintenance mode page template. This Mode useful when you want to disabled the site temporary when you work with your web server. The web server (running the website) is currently unable to handle the HTTP request due to a temporary overloading or maintenance of the server. URL redirection mode, also called URL forwarding, is a World Wide Web technique for making your site forward the site URL address into new one. You can add your other and new site URL here to introduce it to your users. You can see your all change on live preview page. In pro version, plugin have more than 5 News Letter Subscriptions APIs like Mail Chimp, Mad MIMI, Aweber, Get Response and many more. This feature will automatic launched your site when you want. You just add a time frame by counter clock featured and see the magic. This feature shows a beautiful counter clock and progress bar with time frame when your site will complete. This feature will send automatic and manual notification mailed to your users. You can send automated mail to users when your site launched. Mail will be send manually to all listed users (Like Active users, Pending users, both). Our All landing page templates SEO friendly, you can manage Title, Keywords, description with robot.txt settings. You can add your site Google analytic code in template page. Select Users as Name and Role wise to hide the Site whenever User is login or Not from dashboard. We can restrict the users as IP based and show only selected options from below list. Add URL and redirect to users without IP access. Blocked IP By Server (Service not Available). Blocked IP address access only Template Page (Coming soon mode template). Our All template layout will customize easily to used by drag and drop option. “Coming soon pro” plugin come with multi site support. You can use this plugin with network site without any hesitation. “Coming soon pro” plugin has Multilingual support. You can translate the plugin In Any Language. In “Coming soon pro” plugin, You can add unlimited social icon and link into plugin templates. Custom HTML Editor Design Your Own Template. “Coming soon pro” plugin have 500+ Google fonts to give more beautiful look to our plugin landing page templates. Change template color scheme with this featured easily. “Coming soon pro” plugin have default and custom color scheme module for you. Download subscriber with your choice. Download all subscriber in CSV file, who confirmed by mail (Active subscriber). Download all pending subscriber in CSV file. Who got the mail but still not confirmed. Download all active and pending users list in CSV file. Our all responsive template compatibility with all major browser and devices. Custom CSS editor give you a powerful feature here. No need to use custom CSS plugin, just paste your CSS code and see the magic. You will use your custom designing with our and your designed template section easily. Our “Coming soon pro” plugin have background slide show from multiple background feature list. You can add unlimited slides images with slideshow player with many customized settings like. Background color is the one more featured of our plugin. This featured will use to custom color in background. If you want to play your site introduction video and any YouTube video then you will use our background video featured. You need to add just YouTube video id. About us section will useful to introduce yourself in your single landing coming soon page. No extra pages and menu bar needed. Service section will useful to introduce your site key-points. Add unlimited services with details. Add link into heading of your service. Our all template will come with newsletter form, so no need other plugin for subscriber from. Visiting user will contact you easily. We give you multiple newsletter API subscriber form with database table. WordPress default WP mailer, PHP mail, SMTP mail. Subscriber user table with export in CSV file. Customized message and text input section with custom color. Introduce your team member with social link and position. You can add multiple team members in this section. Add social link of your team members. Add position and description of your team members. Add Google map embed link into your coming soon landing page to show your address location in Google map. Contact us section have a contact form to your visitors. Visitor will contact you with submitted the detail form. Contact us section also have google map, Address, contact details and Email section. A contact form to connect your visitor. Add your address, email id and contact details. You can add unlimited social icon with link to linked your social profile in our coming soon landing page. You can add your Banding & Copyright details in footer Section of landing coming soon page.